Recently Dell partnered with Marie Claire, Intel and JetBlue to execute the first invite-only female entrepreneur pop-up conference in the sky. The two-day event —called the “Power Trip” — began with over 100 women business leaders chartering a JetBlue plane (piloted and staffed entirely by women) from New York to San Francisco. After arriving, they met with other influential women and had the chance to listen to inspiring panel discussions from Gwyneth Paltrow, Tyra Banks, Bethany Mota and many more. 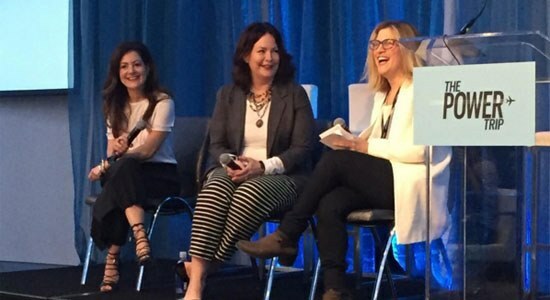 Aside from creating an opportunity for powerful women to network and gather inspiration from their peers, Dell’s goal for this event was to communicate the importance of technology and offering solutions for the way people actually work. Specifically, we wanted to demonstrate that work is happening everywhere and at all hours, therefore we no longer need to remain seated in our office Monday through Friday. And what better way to show this than participate in a conference 30,000 feet in the sky? 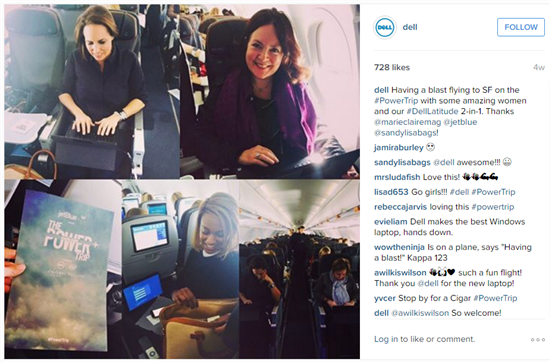 During the five hour flight I had the pleasure of surprising the women with a Dell Latitude 12 7000 Series 2-in-1. These women live and breathe their business and we wanted to show them that there’s technology, like this lap top, that allows them to work efficiently even while on the go. “Once we’ve reached 30,000 feet, the fun really begins—Allison Dew, global marketing VP from Dell, announces that she’s giving a Latitude 12 7000 series 2-in-1 Dell laptop to every woman onboard the plane. 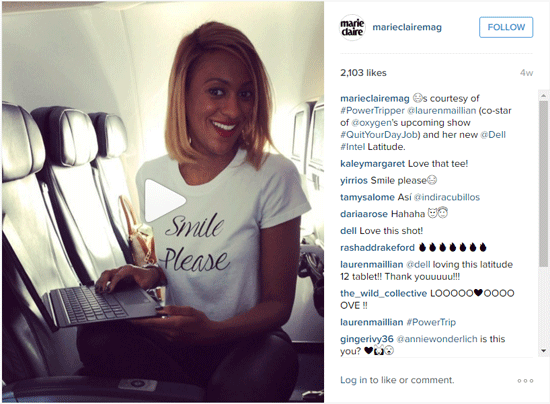 It was major,” Annie Fulenwider, Editor-in-Chief for Marie Claire told Fashion Week Daily. It’s not just a numbers game: Gartner forecasts that 6.4 billion connected things will be in use worldwide in 2016. But it’s also a complexity game – it’s new behaviors, new technology, and increasing globalization. Work is happening everywhere and all the time: For many employees, work gets done at home, in coffee shops and even on public transportation. Also, 52 percent of employees believe that those working from home are just as productive as or more productive than those in the office. There’s a conflict between IT policies and desire for productivity: Security, in terms of protecting data and controlling access, is a huge challenge facing organizations. The business implication and loss of productivity can be significant. But companies also need to consider a balance with devices that are desired by end users. We ended the panel discussion by addressing the common security concerns that business owners have with allowing employees to utilize their personal devices for work. I told the women that when it comes down to it, they know that they are more likely to attract and retain top talent if they provide the best technology and workforce policies to support it. This means that they need to find a way to adapt to the evolving workforce while also addressing IT concerns. If they can do this, they will certainly attract the best possible human capital which is key to the success of their business. Power Trip was without a doubt a unique experience for all those involved. I look forward to participating in similar events where Dell can help empower women entrepreneurs to be Future Ready. For more insight on the future of work, visit Dell’s Evolving Workforce Study. And keep an eye out for our new evolving workforce study findings coming out later this year. To learn more about how Dell is helping to empower women entrepreneurs, check out the Dell Women Entrepreneur Network (DWEN).